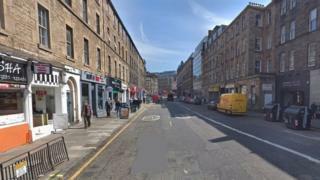 Firefighters have been tackling a blaze near the centre of Edinburgh. They were called to Bread Street at 03:19 after fire broke out in what is believed to be a takeaway food outlet. Six fire appliances and about 40 firefighters were initially involved. There have been no reports of injuries. The road has been closed and traffic congestion in the area is anticipated.